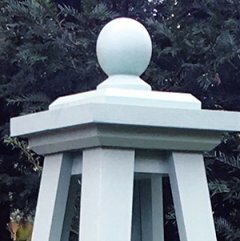 The Chippenham wooden garden obelisk is a large obelisk and with its gracefully sloping sides will add dramatic year-round appeal to any garden. At just over six feet six inches tall it will tower above your ground cover plantings and perennials. While, with its Classic four-sided design and planted with roses, clematis or honeysuckle will transform even the most neglected and dullest of garden corners into cascades of colours and scents. The Chippenham wooden garden obelisk looks delightful twinkling with frost on a bright winters day. 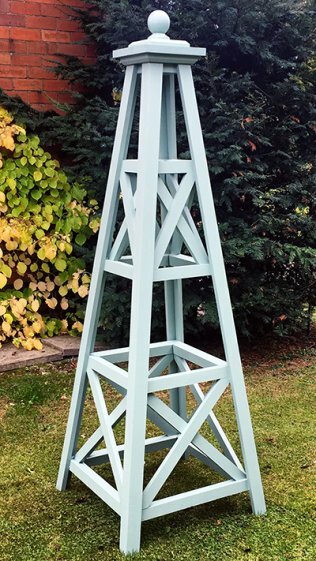 The Chippenham wooden garden obelisk is manufactured in our own country workshops. 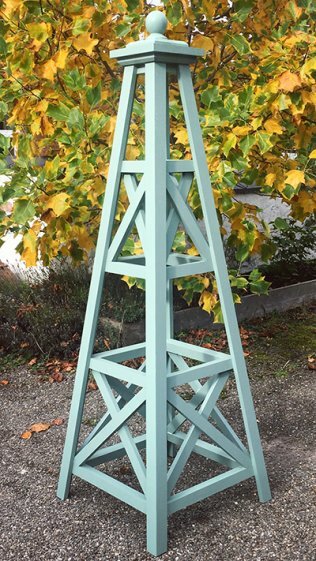 Handcrafted in Scandinavian red pine (other timbers on request) and finished in Cuprinol garden shades or Farrow and Ball exterior paint.